Trick or treat! Dress up as a cute ladybug for Halloween. 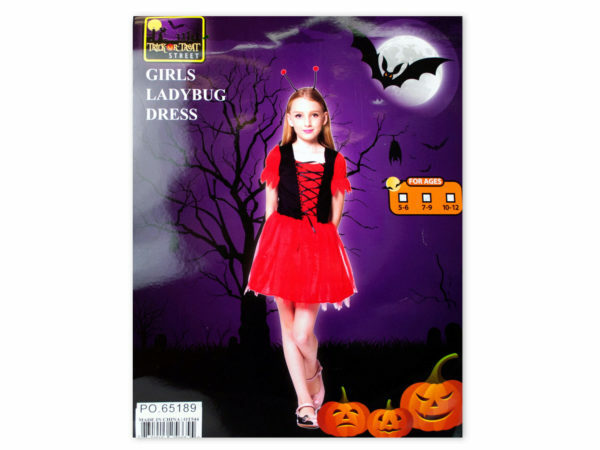 The red and black dress comes with a headband with ladybug antennas. Whether you are going trick or treating or for a Halloween theme party, this dress with defiantly make you feel cute. Comes packaged in a poly bag and size age of 7-9 years old. **Contact Us for bulk order discounts on 8 or more cases. © 2019 Ultimate Distributors LLC d/b/a "Home Decorating Wholesale"